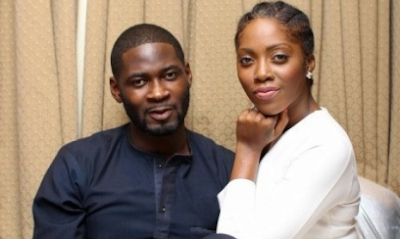 Tiwa Savage’s husband, Tunji Balogun, aka TeeBillz, has technically explained what led to his suicide attempt. He urged people battling with drugs, alcohol and other forms of abuse to seek help. Recall that Tiwa’s 2-year-old marriage to TeeBillz went sour after Teebillz’s rant on Instagram where he accused Tiwa of infidelity. But in reaction, the mother of one granted a 45 minutes tell-it-all interview in which she made shocking revelations about her husband. Following the fallout, Teebillz had attempted suicide but was rescued by R&B songster, Banky W.
He had gone on a rehab for alleged use of hard drugs and his suicide attempt. Months after the estranged couple literally set the social media ablaze, the father of two has advised those who find themselves in his shoes to always seek experts solution. In a new Instagram post @teebillz323, Teebillz wrote: “Black people have been suffering with deep rooted real pride and DHO when it comes to seeking help…… We laugh at people for going to see therapist, we say IF YOU SCARED GO TO CHURCH. “We look down on people who seek help who are suffering from mental health and depression, or drugs and alcoholic abuse or even gambling but the truth is most of us are fucked up and need help for real. “Growing up in the hood, I witnessed ALL LEVELS of mental, emotional and physiological abuse – I’ve witnessed murders, rapes, drugs drive by shootings and drug and alcohol abuse and physical abuse in my home. “It’s hard to be normal when you’re literally on fire in your mind and spirit……. all the money and fame in the world can’t stop you from thinking those thoughts. “They call Kanye crazy and a genius in the same breath but in the end he’s a son, a father and a husband rather he’s doing things you agree with or not he’s still a man who needs help just like most of us. “Y’all think talking your momma or cousin and smokin a blunt or popin a molly is enough nope. “I would encourage you to seek help, I have been for many years and my life is so amazing because of it. “Growing UP in environments and in homes where you see and are exposed to certain things…. you can easily RELOCATE but the effects are still there and won’t go away until you seek professional help – sending love, prayers and all HEART to everyone who can read this. “If you’re suffering please I’m begging of you SEEK HELP.